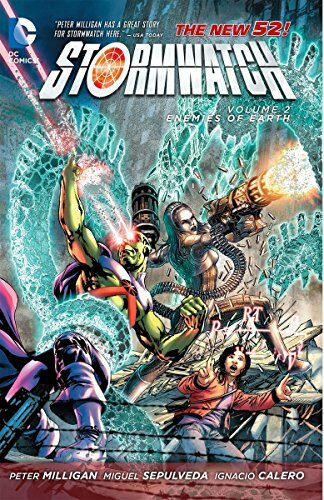 Stormwatch struggles against the threat of the Gravity Miners, and the Martian Manhunter quits the team - but not without a fight! Collects STORMWATCH #7-12 and RED LANTERNS #10. Jack Hawksmoor, Midnighter, Apollo, The Engineer, and Martian Manhunter comprise a dangerous super human police force, Stormwatch, whose existence is kept secret from the world. In this second volume, part of the critically acclaimed DC — The New 52 event, a scientific experiment tears a hole in the barrier between dimensions allowing gravity miners from a forbidden universe to invade our universe. Stormwatch must scramble to unravel the mystery of the unstoppable gravity miners, creatures so alien they defy the laws of science! Stormwatch must put their faith in Martian Manhunter, whose past may hold the answer to stopping the invasion. Irish writer Peter Milligan joined Vertigo in 1989 with the mini-series SKREEMER and soon became an imprint mainstay, writing both SHADE THE CHANGING MAN, HUMAN TARGET, ENIGMA, GREEK STREET and HELLBLAZER. For the DC Universe, he has written Batman in DETECTIVE COMICS and is acknowledged as the driving force behind the Knightfall event. He began his comics career with England's 2000 AD, notably its Bad Company serial. He was named one of Entertainment Weekly's "it" writers in 2002. Milligan is currently writing JUSTICE LEAGUE DARK and RED LANTERNS for DC Comics as a part of DC Comics - The New 52.